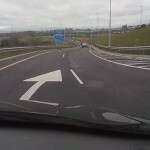 I took this photograph, (left and below), at the junction between the M50 and M1 outside Dublin, Ireland, traveling South bound. As you can see the traffic has to merge from two lanes to one lane before joining the M1 motorway. But my question is, why does the slower inside lane traffic have to move into the overtaking lane? I would have thought that as the outside lane is reserved for overtaking, and therefore used by faster traffic, this lane should merge with the inside lane. It seems dangerous that heavy trucks in the inside lane should have to move over rather than the faster more agile traffic in the outside lane. In my experience, in other countries the outside (overtaking) lane traffic has to move to the inside when merging, which seems safer and more sensible. 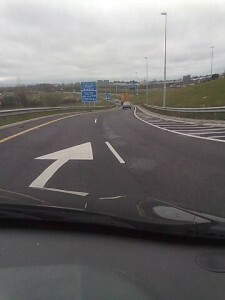 Isn’t it normal practice on a motorway in Ireland and UK to enter and exit from the left? Hi Conor. Yes it is for entering motorways. But when two lanes are merging into one, as far as I am aware only Ireland forces the inside lane to move into the overtaking lane. Normal practice in the UK and elsewhere is for the overtaking lane traffic to move into the inside lane. I have checked this in a few countries (including Northern Ireland) using the ever useful Google Earth. For any Highways Engineers or any Civil Engineers who wish to dabble in road design, these manuals are the gospel for roadworks. They are the basis for 99% of the design of UKs road networks. In terms of merging lanes from right to left, it is usual to be pulling back in from the fast lane, but this is not always the case, in particular with the spaghetti junctions in the UK around the M25 merging with multiple other trunk roads and/or motorways, you could find yourself going left and right on 5-6 lanes. A fine example is Junction 5 off Sevenoaks in Kent, where the M25 merges 2 lanes from the right hand side onto the 3 lanes of the M26. Or is it the other way around? At least on the map it would appear so, but in reality when you’re driving on the motorway, the M25 curves around and with a restricted speed you straighten out at a much lower speed than those coming off the M26 who are on a straight run. Similarly, the merging of the two motorways form 4 lanes, in which case those on the inside lane of the M25 coming in will end up on the 3rd lane overall, while the cars coming off the M26 is in a similar fashion. Hence cars will try to cross each other’s path, the fast M26 cars try to pull out onto the fast lane while the slow cars from the M25 pull in to the slow lane resulting in a clash of vehicles and potential accident black spot resulting in a lot of accidents. 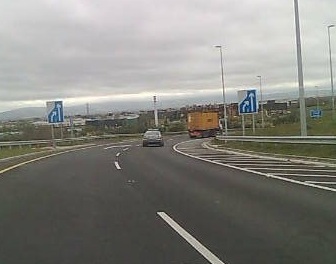 In saying that, the situation in this instance above, is that of a slip road, in which case, it is very odd convention to be applying motorway design principles to a single or even dual carriageway. It could possibly because of the restricted land available to do it the right way. when two slow moving lanes of traffic converge into one lane, particularly in town there is not normally any warning other than arrows painted on road surface advising traffic to merge. No one has right of way and it is common sense to merge zip fashion how ever it is normally accepted that right hand lane has priority same as using a ramp to enter a major road with emphasis being on giving way to whichever vehicle is in front of the other.. If you have a vehicle level with you on your right it is poor driving and dangerous to try and out accelerate it to the merge point. Generally priority to right but should be no need to stop as many do in these situations, its called judgement, same at roundabouts where women in particular seem to think it is necessary to stop before they look to see if anything coming?